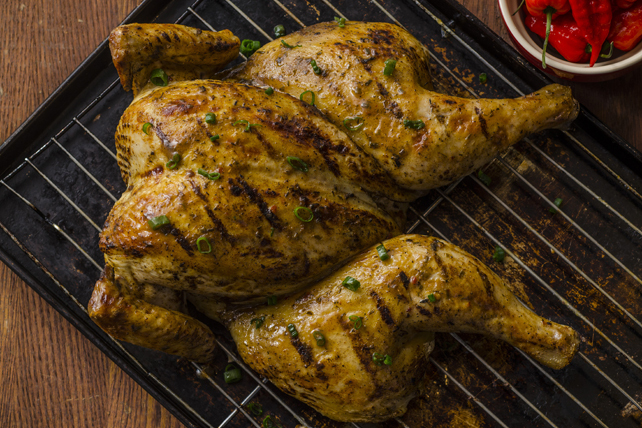 The Caribbean marinade adds irresistible flavour to this Jamaican-inspired chicken recipe that is equally delicious whether grilled or baked in the oven. Place chicken, breast side down, on cutting board. Starting at thigh end, cut along one side of backbone with kitchen shears. Turn chicken around; cut along other side of backbone. Remove and discard backbone. Turn chicken and open like a book; press firmly onto breastbone to flatten chicken. Transfer chicken to shallow dish. Slide your fingers under chicken skin to separate skin from meat, being careful to not tear the skin. Reserve half the marinade; rub remaining marinade evenly over outside and under skin of chicken. Reserve 1 Tbsp. onions; sprinkle remaining onions over chicken. Let stand 20 min. Heat barbecue to medium heat. Sprinkle chicken with pepper. Tuck wings under back of chicken; place, skin side down, on barbecue grate. Grill 10 min. Reduce barbecue to medium-low heat. Turn chicken. Grill 55 min. to 1 hour 10 min. or until done (165ºF), brushing with reserved marinade after 40 min. Transfer chicken to cutting board; tent with foil. Let stand 10 min. before carving. Sprinkle with reserved onions. Marinate chicken as directed. Heat oven to 425°F. Place chicken, skin side up, on rack in roasting pan. Bake 15 min. Reduce oven temperature to 325°F. Bake chicken additional 1 hour to 1 hour 10 min. or until done (165ºF), brushing occasionally with remaining marinade. Look for pre-flattened, or spatchcocked, chickens at your grocery store. Or, ask your butcher to prepare it for you. Garnish with chili peppers before serving. Rub marinade onto chicken and refrigerate up to 24 hours before grilling as directed.